As leaders in marketplace lending, we consider ourselves to be your performance partner. There is risk and you need to be aware of it. However, through rigorous credit analysis and real-time well-balanced performance reporting we endeavour to make your investments as transparent and robust as possible. For extra peace of mind, Insurance & Loss Protection is also factored into the equation. Marketlend and an Insurer, by its representatives conduct various risk assessments, audit checks at the application and ongoing including accessing merchantile reporting, monitoring exposures throughout the insurers credit portfolio and reviewing historical payment information on the company sole traders. Marketlend analyses the likelihood of the payment of the trade credit facility and the certainty in this analysis using complex algorithms and software developed in conjunction with contractors from the Department of Defence and Marketlend rish assessors. The risk assessment model is an in-house financial risk analysis program, that takes into account multi-level factors, obtained via third party external sources and the borrower. Of course it is a system result, and you may have your own view of the risk, that is why you can make your own determination, and if you wish to see how our risk assessment model got the result you can contact us. At any time, for a nominal fee, you may obtain another risk assessment on the trade credit facility, use the contact us form to make request. We are aware that our job is not over when the loan is settled, we place a personal property interest security on the borrower’s assets and register the borrower with our merchantile agent, Creditwatch, so we can monitor the borrower after settlement. Any change to the borrower that is reported, we assess and speak to the borrower if we need more clarity. If the change is a negative change, we will then determine the appropriate steps to enforce the loan, as this is a term of default under the borrower’s agreement. Statistics are available at this link. Actual Seasoned Returns statistics will be available soon. 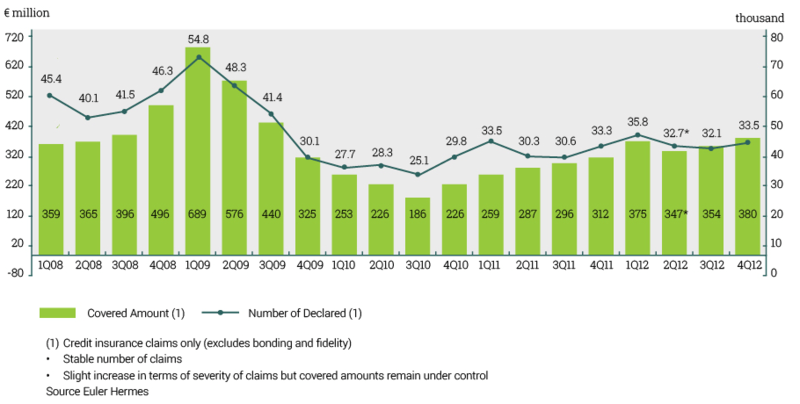 To assist you in your risk analysis, here is a chart of the insurer’s claims history on similar loans*. On settlement of the loan, 1% of the loan amount is held in provision in case of any loss. If the borrower elects to pay interest only, excess interest payments paid monthly are held in reserve. For indicative purposes, a public company who finances working capital loans of a similar characteristic to these loans, has had 2.2-2.5% expected loss on its portfolio. This means for every A$100, you could lose A$2.5 dollars. However this number is based on an average and on individual loans, it could be lower, higher or all of the loan. * Please note the above chart, does not reflect the expected performance of an individual Marketlend investment. Already an investor? Sign in and try!